Welcome to the happiest, fun packed, years of your life… god willing! When we take on a new puppy, the last thing on our minds is being without him/her. No one wants to think of a time that a decision has to be made to do what is best for him/her. We sign an emotional contract to look after that helpless being through cloudy/rainy days as well as sunny ones. Dogs are an expensive and time consuming business but this must be considered when picking up that bouncing bundle of fun. We have to ensure that we have the facilities to ensure that they are happy and healthy at all times. Its important to remember to be prepared. Our pets are living, breathing animals that can get ill just like us. They cant tell us when they don’t feel well but you can usually tell just by their behaviour. You have to learn to read between the lines. Regular trips to your groomer can help too, they have their hands on dogs all day and can usually tell if there is something that is slightly out of the ordinary. Obviously, they cant tell what is wrong but it may flag something up early so as to allow you to notify your vet and start a course of treatment early. 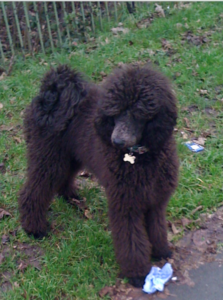 A few years ago I got a black standard poodle puppy called Alfie (pic above), he was the most beautiful puppy in the world in my eyes. Wonderful nature, incredibly calm, walked to heal naturally until he got to the park and ran around like a nut case. At 4 months old, we were over the park and Alfie was once again running around like a nut case when all of a sudden he collapsed. Literally from no where. I ran over to him and all of a sudden he jumped up as if nothing had happened. I thought it was strange but I guessed he was just being silly, then it happened again and I had to carry him back from the field barely conscious. We rushed him to the vets and on the way he seemed to perk up, by the time we got there he was back to his normal self. I felt like a bit of a fraud but I wanted to make sure he was ok. Unfortunately, Alfie was diagnosed with Cardiomyopathy. The vet that we went to recommended euthanasia there and then. My heart broke immediately. I absolutely didn’t believe the vet and whisked Alfie away wanting to protect him with all of my power. He was only 4 months old for goodness sake. How can this happen?? I went for a second opinion, this time the vet had a much better bedside manner and gave me options. Unfortunately, Alfies pedigree Pet Plan Insurance had lapsed and I was in the process of getting a new insurance for him so he had no cover. I didn’t care….I would have re-mortgaged my house to make him better had it been possible. He went for several tests and procedures but nothing that made him uncomfortable. It came to the point 3 months later where we had to make a decision. Alfie had another heart attack and his heart stopped in my front room. He rallied again and back he came as if nothing had happened and we knew that the day had come and we had to take the decision to end his suffering. It was the hardest decision I have ever had to make in my life and not a day goes by that I don’t think of Alfie. The thing is, for all the sad and terrible things that inevitably happen during the course of your pets life, the great outweighs the bad. The amount of joy your pet brings you, the unconditional love that they show you is absolutely worth the investment of your heart. So, don’t be afraid to give your dog 100% as they will certainly give you the same back. I always say to my customers that have lost a beloved pet, that they should feel proud that they gave that little being love and care and that their pet knew how much they loved them. A lot of people say ‘I could never get another dog’ and I always say, once a pet lover always a pet lover. Time heals, you will never forget the pet that you lost but in time there may be enough healed heart to allow another little soul in. Don’t be afraid of loving that little pet but remember, all relationships have their ups and downs, we just all have to do our best. Love and laugh on the sunny days and don’t be afraid to cry on the rainy and cloudy ones.